APC loaded on train to be taken exercise area. The M113 Armoured Personnel Carrier, APC for short, was our main mode of transportation. 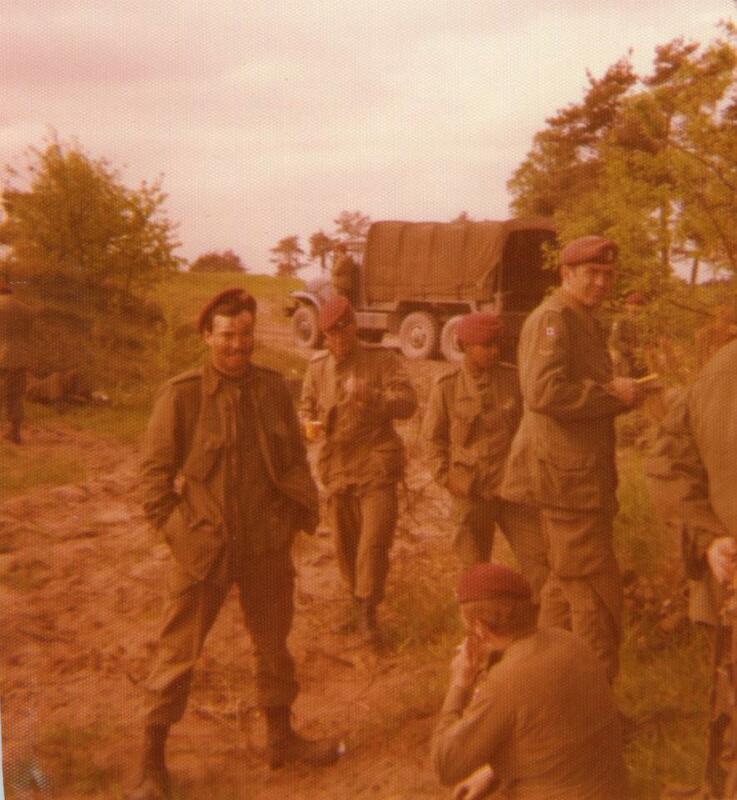 We were a fully mechanized armoured group and the only Canadian Battalion in Europe with that distinction. In 1974 these vehicles were already twelve years old, having come into service in 1962. They were fully tracked and made of aluminum, therefore lighter than their predecessors. The armour would protect the soldiers from small arms fire but was useless against any large calibre round. They were transportable by air and we were advised that they could swim. I had the unforgettable opportunity to see how amphibious they were. At almost 16 feet long and weighing in at 11 tons, if you did not plug all the holes properly and made sure the seals on the doors and ramps were in good working order, the beast would sink within seconds of getting in the water. Part of my Driver Track course was to learn how to swim the beast. When you first got in the water, the tracks acted like paddles. As long as you kept the pedal to the metal, everything was fine but, if you let up on the gas you could be in trouble. Only the top 18 inches of the APC were above water. The rest was submerged. Not a pleasant sight or feeling for a mechanized armoured driver used to dry land. I remember the glorious feeling of the tracks gripping the rocks as it began to crawl out of the quarry after my swim. If my APC had gone down, I would have gone down with it since I cannot swim. When a convoy of APCs roared down a road, you could hear them approaching from miles away. The smell of diesel blowing in your face from the track in front of you was a smell you could never forget. Going through the small villages, the ground around the houses would shake. It was an awesome sight to see. People would be on their balconies, waving as you drove by. The German government was not thrilled about the Canadian military driving dozens of heavy tracked vehicles down their fine paved roads on their way to an exercise. Who could blame them? The steel threads ripped the roads up and someone had to pay for it. In theory, the offending soldiers’ government was responsible for the damage done. Whether or not Germany received full compensation is anybody’s guess. In some cases, in an effort to save the roads, the APCs were loaded on large flatbed trucks. 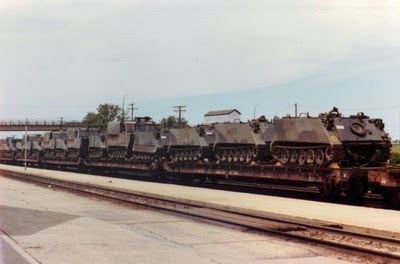 Then slowly the vehicles were moved in a convoy to the railhead. 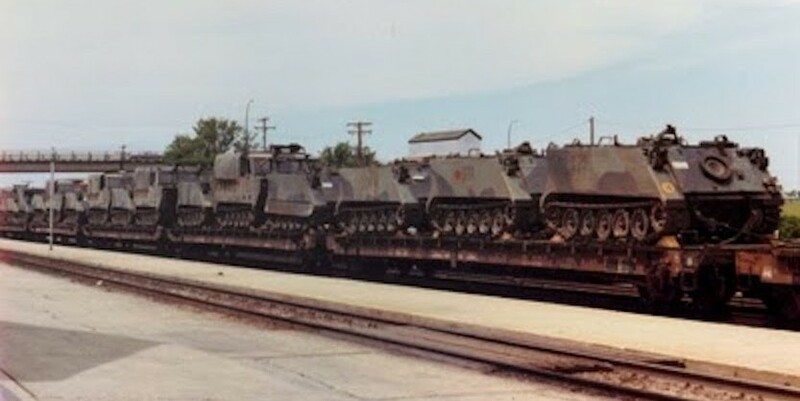 When the APCs arrived in the town of Rastatt, they were loaded onto large freight trains for their trip to the exercise area. Loading 11 ton APCs onto trains is a tricky business since the train bed is not much wider than the APC itself. The vehicles had to be secured down with heavy chains. We had lots of opportunities to get our hands cold and bloody during this process; nevertheless it needed to be done and done right. The German population would not have appreciated APCs falling off the trains on route to the battlefield, crushing whatever was in the way. 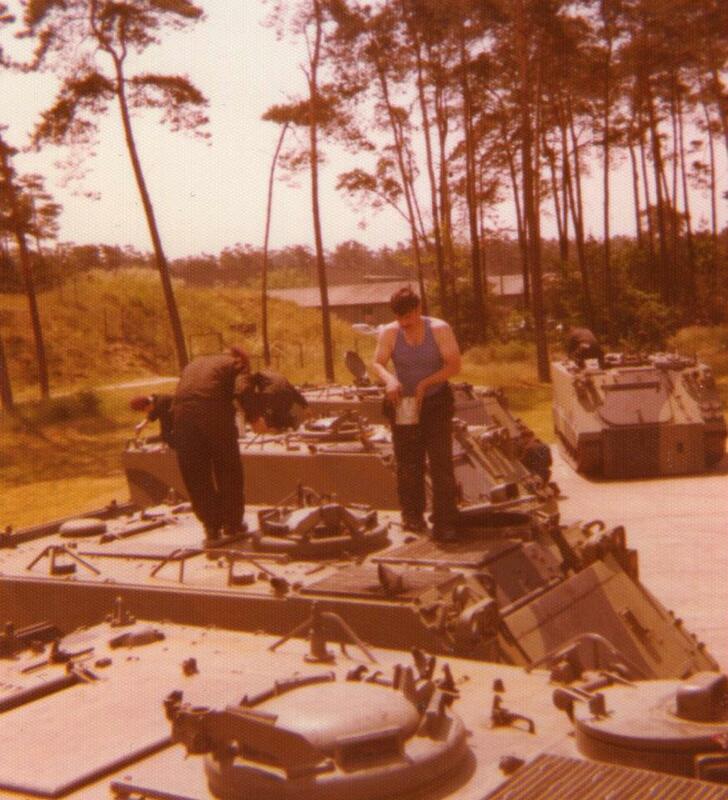 After the APCs were loaded, we boarded trains as well to be transported to our training area. Cold old trains with seats to sleep on during the long journey. We were shuffled along the track slowly to our destination. 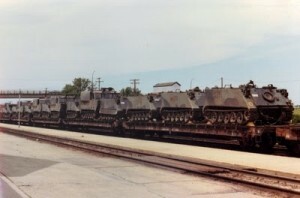 During peacetime exercises our train was pushed off to a side rail while faster civilian trains were allowed to go through. In wartime, it would have been the other way around. When we arrived at our destination, which was the starting point for the exercise, we unloaded the vehicles and moved out to our first objective. When arrived at our position around midnight, a lone APC with 8 soldiers aboard, we were told to hold fast until another group moved up to reinforce us. It was cold and the fog was rolling in great swaths. You could hardly see 5 feet in front of you. Our tasking was to hold a small bridge. In early morning, about 6:00 AM, we could hear vehicles approaching. We thought our reinforcements had arrived. Our APC was off to the side of the road behind small copse of trees. A bit of light was showing through as the sun began to rise and the squat silhouette of the APC with a soldier manning its 50 cal machine gun could clearly be seen. We soon realized the vehicles were from the enemy side, led by a captain in a jeep. We could see a convoy consisting of 6 two and a half ton trucks full of troops. We knew we were outnumbered and our crew commander, a seasoned Sergeant, took the initiative. He climbed out on the bridge and put up his hand up to halt the column. He informed the Captain that we had a full company of APCs waiting in ambush and that he was now a prisoner. He boldly pointed out our firepower and armoured vehicles, not like their thin skinned trucks. It was a risk but one that paid off handsomely. The captain surrendered. He informed us that they had just flown in on the air bridge from Kansas two days ago and had been sent on their way. The problem was that there were no maps in the trucks and the radio, although working, was useless since he did not know what frequency to use to call his group. They had been driving around, lost, for almost 36 hours and had no idea where they were. They were lost in Grafenwoehr, only 60 miles from the Czech Republic border and real troops from the Soviet Block. They had not had a bite to eat in over 24 hours. They were Soldiers from the Kansas Army National Guard. Most were weekend warriors, citizen soldiers called up in times of emergency. They had never been in a situation like this one, from their usual one night a week training thrown into an exercise lasting 4 weeks. They were just cannon fodder, very small cogs in a very big and unforgiving wheel. This exemplifies the constant breakdowns during all ReForGer (REturn of FORces to GERmany) exercises, which it had to be. You cannot put 100,000 sleep deprived, untrained troops in a new country without some things not working properly. The purpose of these peacetime exercises was to zone in on these issues and fixed them. In the long run, it saved lives. Unfortunately, when you have thousands of troops in an unknown training area working in close proximity with tanks and APCs, accidents happen. Some people get hurt and some lose their lives. Frank Reid is an author, playwright, consultant, and a former soldier in the Canadian Army. This blog series offers accounts of his experiences as a member of Canada’s military during the Cold War. Thanks for the story I remember it well not the same ex but very much the same. Great memories. Thank you, Frank Reid, for sharing this detailed story. It was very informative!